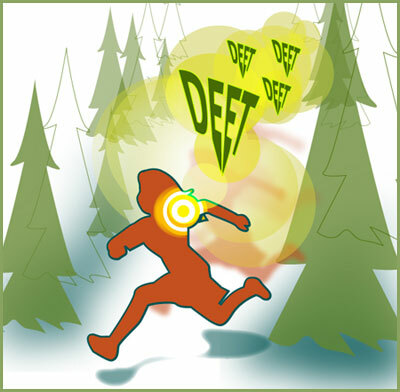 DEET is a common insect repellent used all over the world since the late 1950s. It stands for N-diethyl-met-toluamide. It was developed by the U. S. Department of Agriculture for the Army in 1946. It is very effective at repelling biting insects like mosquitoes. Used according to directions, repellents that contain DEET are perfect for protecting yourself from annoying mosquito bites while you're enjoying your deep woods fishing trip. If you haven't been out to the woods lately, protection of some kind is necessary. Entire clouds of mosquitoes will hover on trails, ticks populate the bushes and black flies, gnats and other biting insects love to hang out around the water. Unless you want to come home looking like one giant insect bite, prepare yourself before you go with a good insect repellent. If you look at the different DEET-containing repellents on the market, you'll notice that some contain 6%, some contain 15% and still others contain up to 90% or more DEET. The higher concentrations last longer on the skin than those with lower concentrations. If you are fishing with children, the American Academy of Pediatrics suggests that they should not use a concentration higher than 10% due to safety concerns. Some people are also sensitive to DEET, so if you notice any rashes, swelling, itching, or eye irritation, you may want to switch to a different insect repellent. In severe cases, slurred speech, confusion or seizures have been noted in a very small portion of the population. For the vast majority, however, DEET has worked for generations to keep mosquitoes at bay. This is an important criterion, since mosquitoes transmit diseases like malaria, encephalitis, dengue fever and West Nile virus, depending on what part of the world you plan to visit for fishing. Tests have shown that wristbands with the chemical imbued into them are not effective. The best way to repel insects remains the tried and true method of applying a product to your exposed skin. A good guideline to use if you don't know which formulation is right for your situation is to choose a 5-10% concentration if you will only be outdoors for 2 to 4 hours, or insect levels are minimal. This is the category to use for children. Concentrations of 20 to 100% are best for prolonged exposure in regions with high insect populations (like hunting or fishing, for example). If you are prone to a lot of insect bites no matter where you are, you may want to try a higher concentration as well. When using DEET products, be sure and apply them only to exposed skin. Do not apply to skin that will be covered by clothing. Don't apply it to areas where the skin is damaged or broken. Use caution when applying it around your eyes, mouth and ears. Re-apply according to directions on the label. There are many DEET formulations on the market to choose from. Pick the one that will best suit your needs. Broad spectrum sprays will protect you from mosquitoes, biting flies, gnats and ticks. You can get it as a pump spray, an aerosol, a spritz, towelettes, a stick, or as a lotion to apply to your skin. You can also find some that are time release formulations. They are made through a process that traps DEET in little capsules on the skin. DEET works by evaporation, and by having some of the DEET encapsulated, this slows down the process so your protection lasts longer. Choose the application that fits your preferences the best. Luckily, insecticide is one of the least expensive items you'll need for your next fishing trip. For those who venture into the deep woods where dense mosquito and tick populations lurk, you can even find a formulation of 100% DEET. This can be overkill for most people, but when you're walking through thick clouds of insects, this can literally save your skin.